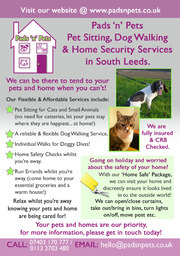 Pads 'n' Pets, Pets Sitting, Dog Walking and Home Security Services in South Leeds. 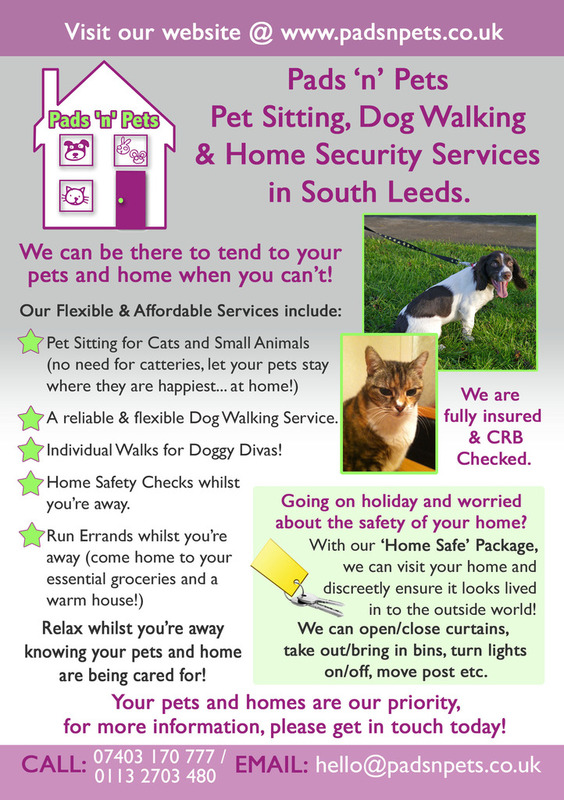 Pads 'n' Pets provide a reliable pet sitting and dog walking service in South Leeds and the surrounding areas. We are 2 mums with a passion for animals and your pets are our priority. Going on holiday should be a relaxing time, but the prospect of finding a reliable cattery can be a stressful and expensive time for you, it also means a stressful time ahead for your beloved pets too. We're here to provide in-home care visits for your cats and small pets, so that you can rest easy knowing your pets are being cared for by people who love animals and will provide the care and attention they need. We also provide a reliable and flexible Dog Walking Service, allowing your pooches to get the exercise they need when you're out at work or away. Group walks and individual walks available and tailored to your requirements. In addition to our pet services, we also offer home security check services, giving you the reassurance and peace of mind you need that your home is safe and secure. Testimonials are curated by Pads 'n' Pets Pet Sitting & Dog Walking Services and are not independently reviewed or verified. "Pet Sitting & Home Security"
"Thank you Pads n Pets, we cannot begin to express how grateful we are for the excellent care and service you provided during our recent trip away. You made us feel completely at ease, keeping us appraised of Oreo's well-being which was reassuring for all of us (especially our daughter) to know that he was happy and safe. Your home safe package is a great added extra too, knowing that someone is calling to open and close your curtains and even bring your bin back in on bin day gives you peace of mind that your home is safe. It is obvious that Shelley and Amanda are animal lovers who make you and your pet's happiness their number one priority. I would recommend to everyone I know."